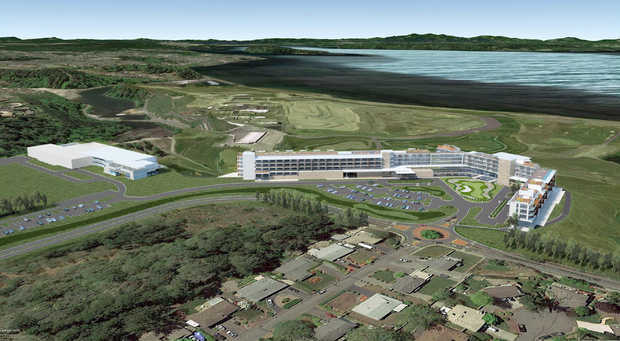 A Los Angeles developer unveiled drawings Tuesday for a resort at Chambers Bay in University Place that would be big and dramatic with a five-story hotel and sweeping views of Chambers Bay Golf Course and a proposed second course. 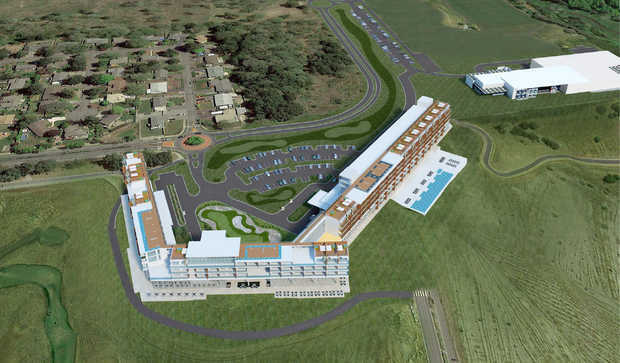 Chambers Bay Resort would consist of the 258-room hotel, a conference center, a 180-seat cafe and restaurant, and a swimming pool. The conference center would be located in what is now the county’s environmental services building, with a ballroom added on. Pierce County Council members saw the architectural renderings for developer Bob Sonnenblick’s project for the first time Tuesday. “That is the public’s property,” Ladenburg said. Those public amenities include the trails, parks and playground as well as the golf course where the 2015 U.S. Open will be played. Her husband, John Ladenburg, was the county executive who spearheaded developing the former gravel mine into a championship golf course in 2007. “To make sure that (citizens) still feel that that’s their property, I think, is very key with any development that we do out there,” said Connie Ladenburg, whose district includes University Place. County-owned Chambers Bay Golf Course will host the U.S. Open June 15-21 of next year. 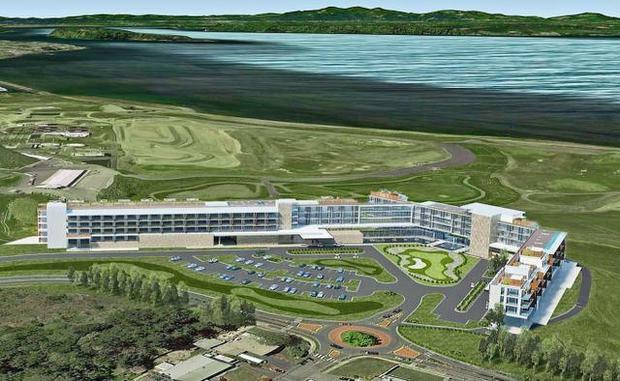 The resort hotel proposal is many months away from a final decision and would not interfere with the golf championship. Deputy County Executive Kevin Phelps said it will take up to 18 months to update the master site plan, which would require approval by the County Council and the City Councils for both University Place and Lakewood. The County Council likely would have to authorize the county executive to enter into an agreement with Sonnenblick. Sonnenblick started a second 90-day extension granted by McCarthy for planning the project last week. Phelps said Sonnenblick will have to propose financing that meets the county’s needs. The master site plan must be modified, and Sonnenblick must determine if he can fit in a second golf course. Sonnenblick, chairman of Sonnenblick Development, said his $150 million project will enhance public access to Chambers Creek Regional Park. He said the project’s lower levels would be lifted up and lined with glass so that visitors could see the Puget Sound and the Olympic Mountains. “We’re very excited about the project, and we designed it based on the input from a lot of local groups,” he said. Sonnenblick hired Robert Trent Jones Jr.’s company to design the second golf course. Jones also designed the original Chambers Bay Golf Course. Hole routings for the second course are expected to be completed in about three weeks, Sonnenblick said. A second 18-hole course where golfers could ride carts is crucial for attracting older, higher-income customers to the resort, Sonnenblick said. Chambers Bay prohibits carts to prevent damage to fescue grass on the links-style course. Sonnenblick met with University Place planners last month to ask questions of city planning staff as it related to his proposed development. The City of University Place is waiting to see more detailed information about how the site will be developed, including plans for the second 18-hole golf course. But Sugg did say the city is interested in the project. “The idea of a destination golf resort in UP is certainly appealing, but the details will have to be worked out,” he said. Sonnenblick’s plan describes the hotel as reaching 66 feet, which is taller than the city’s current zoning allows. That is one of the issues that would have to be addressed through the site plan amendment process, Sugg said. “We’ll let the process determine the outcome,” he said. The only two council members to offer feedback were Connie Ladenburg, D-Tacoma, and Stan Flemming, R-Gig Harbor. Both voiced concerns about whether public access would be maintained.